The Max Keren Company INC is a company that specializes in container transportation, machinery shipping, transporting heavy equipment and having many years of experience in transporting hazardous substances and unusual equipment. At our company we hire and are happy to work with an expert and professional team of workers that executes its work on the best side possible in order to supply the customer’s needs and will. We have a variety of suited equipment meant for executing complex work, hydraulic and different equipment that’s suited for shipping machinery, air hovercrafts, heavy forklifts (18 tons) and low pole forklifts that allow entrance to unreachable openings with conventional equipment, along with a broad selection of advanced equipment. We make sure that every trailer will have a GPS system that allows to deploy real time available information meant for managing the transportation process. This transmitter allows real time reporting about the trailer’s location and it transmits immediate alarms about any exception from the course, stops that take too much time, faults and more. Some of the alarms are directly sent to those who are in the management and security roles in the company, such as the security officer, the main steward and the manager on duty. The company’s drivers are running luggage tests before loading it, and intercept any information about exceptional damages, and transporting in the times and lanes who fit the most to create the minimal danger regarding an exceptional transportation. Our drivers team is a professional and experienced team that makes sure to keep up with the company’s professionalism and always standing up in terms of efficient, trustworthy and right service. The Max Keren company has a fleet of 35 semitrailers and 60 types of different dragged devices that fit every transportation and any requirements needed. 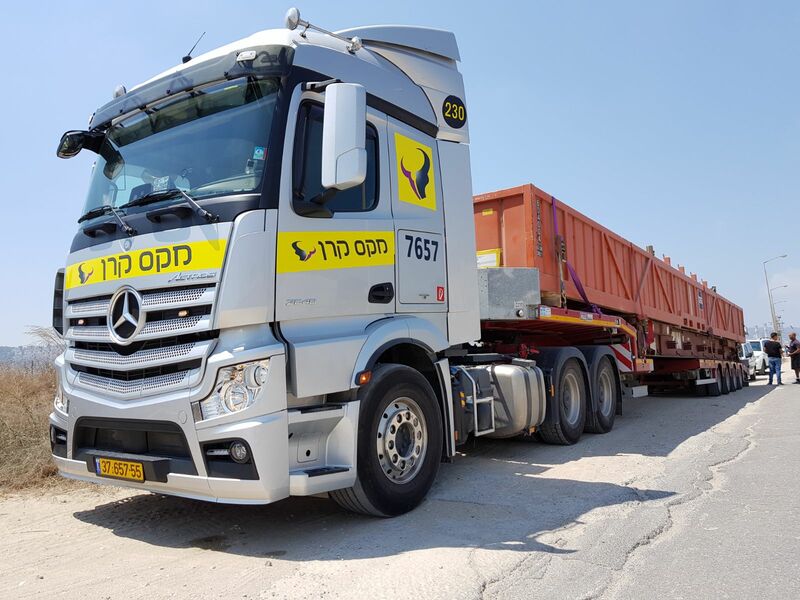 Over the years, the Max Keren company constantly grants its services to many factories in Israel while getting their full satisfaction regarding various projects. The Max Keren Company is the most professional and experienced factor to perform all of those special transportations and projects. For every consultation or need of services in that field, you can contact us and our experts will be happy to talk with you, recommend you what’s the best way for you to perform the task and will get you a fixed priced offer for the execution of the project. We have created a professional and secured workplace that feels like a family, and we’re proud to say that our most expensive asset is our workers teams and their character around the company. Our workers drive the system along the whole year, in every hour in the day with great dedication and précised timing. There’s a controlled synchronization between the teams so the team that works at the night duty prepares the actions for the morning after and makes sure that all of those actions will be held in a great and organized matter. Keeping up with the schedule, controlled and exact execution of every mission and a constant update to the customer in any moment needed in order to create an honest, continuous and updated communication.